In their Tuesday, August 15, 2017 “Editorial: A terrific way to honor a Berks native’s literary legacy,” the Reading Eagle, where young Updike worked as a teenager, approved of The John Updike Society’s progress in turning the house at 117 Philadelphia Ave. into a literary landmark and museum celebrating Updike and Shillington. “We feel a special affinity with Updike at the Reading Eagle. He was a copy boy and Teletype operator for us in the summer of 1950. “In his prolific career, he published novels, short stories and poetry, and was an estimable art and literary critic. His work garnered two Pulitzer Prizes, two National Book Awards and numerous other honors. “We congratulate the organizers, builders, scholars and others who have made extraordinary progress on turning Updike’s childhood home into a museum and look forward to the day it opens and readers young and old can see where the artistry of its namesake was born. 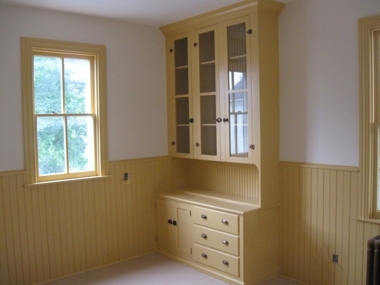 Pictured is the newly restored kitchen of The John Updike Childhood Home (photo provided by R.J. Doerr, whose company is handling the restoration). This entry was posted in First Person Singular. Bookmark the permalink.